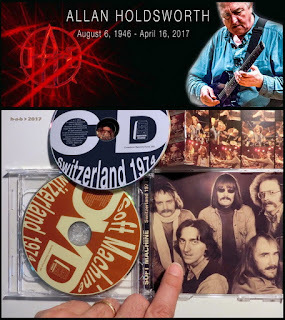 Tra i primi a reagire alla notizia dell'improvvisa scomparsa di Allan Holdsworth è naturalmente Leonardo Pavkovic, grande amico del chitarrista e per molti anni suo produttore e manager. Rilancia un appello dei famigliari, segnala un avviso di sottoscrizione in vista dei funerali, e lascia un messaggio personale: "There is no greater measure of a life well lived than the amount of people he had impacted, and by that measure the artist Allan Holdsworth lived a very good life. This man took a plank of wood, a few strings, and some wires and transformed people's lives in a way that few others have. The ultimate genius of the rarest kind. One of THE greatest musicians ever lived." Anche Cuneiform Records lascia un'affettuosa dedica a Holdsworth diffondendo tramite YT un breve estratto dal concerto del luglio 1974 dei Soft Machine al Montreux Jazz Festival, restaurato e presentato in versione audio e video in una sua recente pubblicazione, Switzerland 1974: "The hour-long set is the only available visual document of the Ratledge-Marshall-Jenkins-Babbington-Holdsworth line-up, and it includes live versions of the entire album Bundles, most notably the classic “Hazard Profile” suite, augmented with individual showcases for each member as well as a collective improvisation and brief snippets from Six and Seven. As well as retracing Soft Machine’s transformation into one of the leading exponents of jazz-fusion, it provides a rare chance to witness the genesis of Allan Holdsworth’s unique, innovative and unbelievably fluid and dexterous playing, before he went on to universal acclaim with Tony Williams’ New Lifetime, the prog-rock ‘supergroup’ U.K., Jean-Luc Ponty, Bill Bruford and ultimately his own electric fusion groups."